How did I load lots of init scripts? If you're like me, you have a lot of elisp files for your Emacs configuration. Without considering unmaintained code or junk codes, I have almost 80 elisp files in my $HOME/.emacs.d/. This causes Emacs launching slower and slower. Normally, I don't turn-off my computer, nor I need to launch Emacs frequently. So it was not big deal. 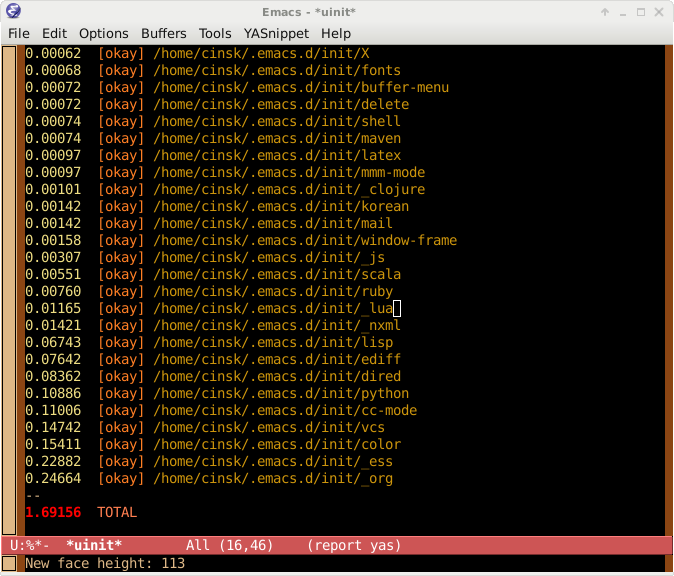 However, sometimes it took more than 7 seconds to launch Emacs on my idle Gentoo machine. Why it took so much time before starting? Which file is the time-consuming monster? Unfortunately, I couldn't answer. So I tried to clean-up my configurations. First, I remove all unused junk from my $HOME/.emacs.d/init.el. Even after that, my init file was too big to maintain easily. So I modulize the init file into separate code pieces. Now, there is just a small init.el, and lots of code pieces reside in $HOME/.emacs.d/init/. For example, my customization for dired package is stored in $HOME/.emacs.d/init/dired.el, and Korean language customization is stored in $HOME/.emacs.d/init/dired.el, and so on. After that, I wrote simple macro, which loads the init code pieces from the specified directory, $HOME/.emacs.d/init/, if it was not loaded before, much like Emacs's require function. You can interpret above code as "If enable-multibyte-characters is not nil, load $HOME/.emacs.d/init/korean.el, if it was not loaded before." In detail, uinit/load function will search whether the given code piece (e.g. Korean.el in above) is loaded before, by searching the list uinit/loaded-init-files. Then if it does not exists, it call call load function to load the file. It also record the duration time of loading the piece, and save it in to the report buffer, "*uinit*". You can grab the source of uinit package from here. Finally, add following code in the end of your init.